In honor of Yom HaShoah (Holocaust Remembrance Day, April 11, 2018), First Congregational Church and Temple Shir Tikvah will co-sponsor a beautiful and distinctive string quartet concert in the sanctuary of First Congregational Church, highlighting the powerful works of three composers who perished in the Holocaust – Erwin Schulhoff, Pavel Haas and Leo Smit. 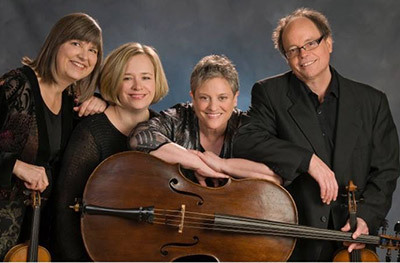 The concert features the Aryaloka String Quartet (Aryaloka is a Sanskrit word which means “in the presence of the noble ones.”), four marvelous local professional string players who have graced national and international stages alike. The quartet, through its music, seeks to inspire, but also to highlight the potential of music to uplift and to bring harmony to a treasured but troubled world. The Leo Smit work is especially poignant as it was never completed; it is performed as written with each instrument heartbreakingly dropping out one by one. The quartet will round out the program with the celebrated String Quartet No. 8 of Dimitri Shostakovich which was “dedicated to the victims of fascism and war.” Each work will be preceded by a very short introduction to the composer and the music and by a brief reading from the works of Nobel Laureate and Holocaust survivor Eli Wiesel, who died in 2016. This important, beautiful and haunting music written by artists who perished during the Shoah, like Wiesel’s own family, serves to remind us that art and music have the power to transcend evil and banality. Reverend Will Burhans of First Congregational and Rabbi Cari Bricklin-Small of Temple Shir Tikvah will offer a brief welcome and introduction. The concert will be followed by a reception hosted by both congregations. A free will offering will be taken at the door. Please join us!